Have your dogs breath smelling fresh with our amazing range of dog treats at Direct pet Supplies Perth. We have a great reange of charcoal treats as well as the ever popular Greenies dental chews. Hunt's Charcos Dog Treats 1kg Charco’s is a natural charcoal based dog treat designed assist in the control of bad breath & bad odours. Dogs will enjoy Charco’s as a treat, and when fed on a regular basis, Charco’s will assist with: Reducing objectionable body odours Reducing the bad smell of a dog’s stool Reducing bad breath in dogs Reducing tartar build-up and tooth decay Charco’s is made from quality ingredients, such as : Acti..
Hunt's Charcos Dog Treats 200g Charco’s is a natural charcoal based dog treat designed assist in the control of bad breath & bad odours. 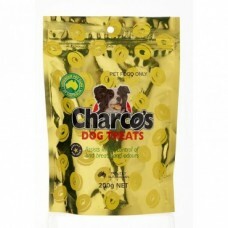 Dogs will enjoy Charco’s as a treat, and when fed on a regular basis, Charco’s will assist with: Reducing objectionable body odours Reducing the bad smell of a dog’s stool Reducing bad breath in dogs Reducing tartar build-up and tooth decay Charco’s is made from quality ingredients, such as : Act..